This sundial can be adjusted to any location in the world to show the true local time. An extremely robust and beautiful precision instrument. The universal ring sundial is the queen of all sundials. It is closely related to the armillary sphere, because similar to this, it depicts the surrounding firmament with its rings. The co-ordination of all the elements lets the ring sundial not only show the time at every place on Earth, but also enables you to find North and South without the aid of a compass. Sundial rings, which were first showed at the end of 14th century, appeared in their present form in England around 1620 and were in use until the 18th century. Some of them can still be found in museums where they count among the most valuable treasures. 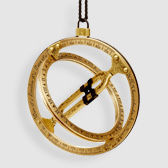 With this fully functional ring sundial you can measure true solar time exactly as sailors, travellers and astronomers did it in the past. The reading is precise down to a few minutes and very easy to do.